We would highly recommend JC Radon Services. Jake is friendly, professional and did a very good job on our system. He explained what would be the best for our situation and his pricing was very reasonable. What a great experience! JC Radon Services saved me thousands of dollars and months of anxiety. Jake was delightful to work with. He was communicative, punctual, precise and was able to look at my problematic situation and craft a solution that works seamlessly. I’m telling everyone I know to call JC Radon Services to get their homes tested. Very happy with the work done by JC Radon Services – very professional, timely and very helpful. thank you! Will definitely recommend to others. Jake did a great job on my mitigation system. His pricing was lower than other estimates and did additional work that was not included in other estimates. Very professional, very knowledgeable and very reliable! Will and have already recommended his service to others! Thanks, Jake….your system has surely made my home much safer! We were very pleased with JC Radon Service. Jake was very professional and displayed a great understanding of what we needed to do with our radon issue. He provided prompt and courteous service. We were happy with the end result. Jake is personal, timely, clean, professional, organized and follows through. It was a pleasure having him put in our mitigation system. Highly recommend! Jacob did a swell job! It was a quick process and very hassle-free. If you need a radon test, I highly recommend JC Radon Services! 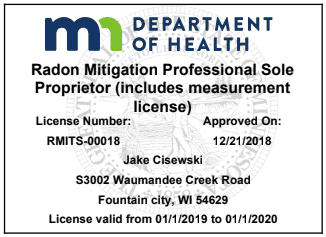 Jake was professional, prompt and did a great job on our radon mitigation system. us the best price I could find around. We were very pleased with JC Radon. Jakes response time was very fast, once the testing was done we had our results within hours. Very professional and answered all my numerous questions! I highly recommend using JC Radon to get fast results about the possible radon in your home.